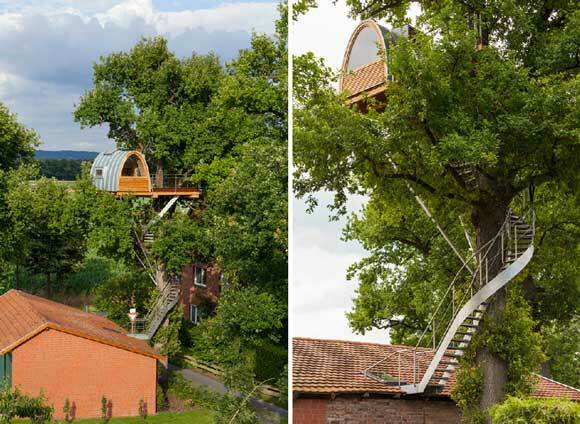 Baumraum builds another treehouse: Halle - Treehouse by DesignTreehouse by Design - So, you thinking about building a tree house? First, the oblong shape is ideal: organic and efficient. That extra space provided by the curve makes it much more habitable than an A frame. At 11 meters off the ground, and nestled in the foliage, this treehouse is certainly not merely an outbuilding on stilts — this is the real deal. Second, the trap door in the patio, which in turn leads to an opening skylight in the studio below. Brilliant. The stairs are also self-supporting metal construction which makes access that much more sturdy and simplified. 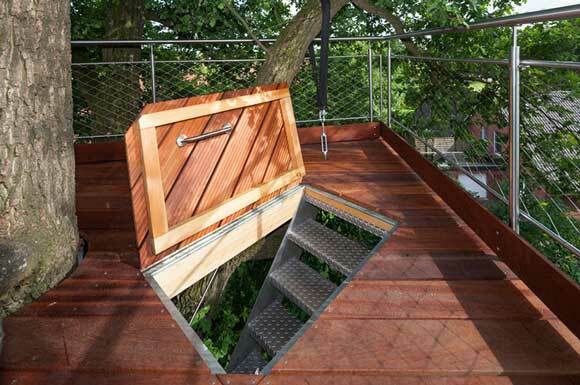 Never under estimate the problems around designing good treehouse access in tight and irregular spaces. Third, the mounting techniques are interesting. 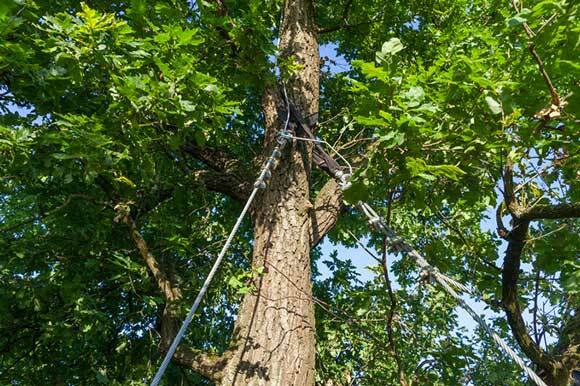 Nylon straps were used to drap through the crotch of the tree branch above and steel cables go from there to the structure. This gets around the issue of using bolt holes, and damaging the tree, however, I’m not sure about the chaffing. I like this approach in principle. 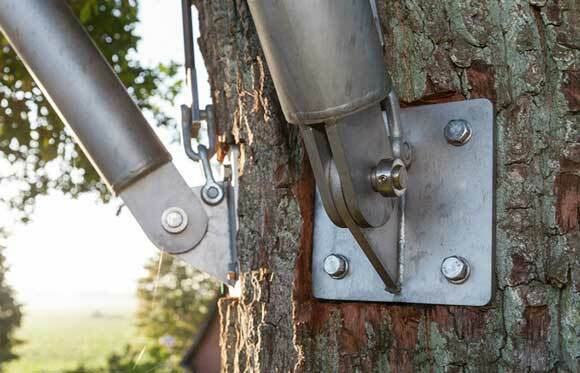 The bottom braces for the floor are metal tube struts that attach via plates to the tree trunk. It is my option that a single large lag bolt per plate is better than 4 small screws when it comes to maintaining the health of the tree. Each hole is a potential avenue for rot or disease. Also, every hole around the circumference of the trunk impedes the transport of nutrients vertically to the rest of the tree. The last issue here is that the tree bark was cut significantly in order to create a flat spot for the plate. Although this serves to distribute the load weight and prevent gouging, shaving into the bark is also a damaging action that can have negative consequences. Having said all that, I’m impressed that this is really insignificant ‘damage’ to the tree while provide a support structure for the entire house — very well done. Fourth, the interior is brilliant. Light coloured wood (yellow cedar? 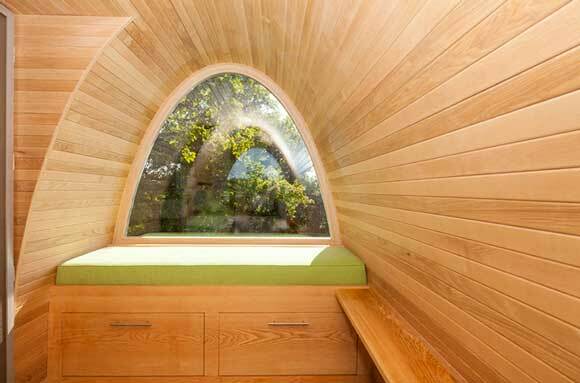 ), lots of windows, and the bowed shape make for an exceptional space. 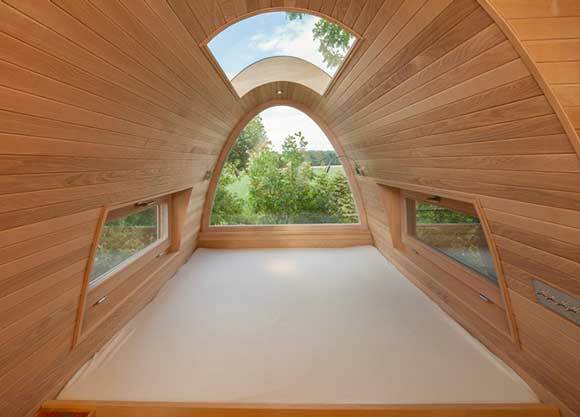 I think the simple aesthetic maximizes the best of what a treehouse can offer. See more on the full article at Designboom.